Spice up your seasonal drink menu with new, profitable items when you use Torani 750mL pumpkin spice flavoring syrup! Crafted with hints of pumpkin, cinnamon, and spices, this flavorful syrup embodies the spirit of autumn and the warmth of holiday cheer. It is packaged in a 750mL bottle that contains about 25 servings. When you think of autumn, you think of cooler days, changing leaves, and pumpkin spice. This pumpkin spice flavoring syrup can bring back that sense of fall anytime of year. And, of course, the Torani bottle on the shelf or in the display window lets people know you're serving quality. This Torani pumpkin spice flavoring syrup is perfect and comparable to what you would find in the grocery store. What makes it even better is you get more for a cheaper price on here and there is a better selection! One of the best pumpkin flavors that Torani offers and nothing brings in the Holiday season quiet like "pumpkin". Its amazing in my morning cup of joe and doesn't require a lot of product to flavor it just right. We go through this pumpkin syrup like water in the fall time. It tastes so amazing in lattes, cold brew or even on top of ice cream. I have tried other brands but this one beats them all. Our customers really love this syrup. It is great for hot/iced coffee, hot/iced latte, hot/iced cappuccino and frappes! Definitely for the pumpkin spice lovers out there! During pumpkin season you can't go wrong with this syrup. Gives you that pumpkin flavor with a little bit of kick of spice that makes your lattes perfect. Is it enough to carry only one type of pumpkin flavor in fall? Of course not. I’m adding pumpkin spice nearby my pumpkin pie flavor too. Our "fall" float was a big hit. We've put this on Ice Cream, flavored coffee, water and mixers. We've never had a bad review on this flavor. Very pleased with this purchase, will re order closer to the fall. This syrup has a nice balance of pumpkin and spice flavor. However, the taste is more artificial than other pumpkin spice syrups I have tried, like Monin. Everybody goes crazy for the pumpkin spice flavor in the fal of each year. This syrup makes it super easy to have a perfect flavor. The taste is excellent. This syrup in conjunction with the pumpkin pie flavor in a blended or milkshake is AMAZING! You get restaurant quality here with Torani. Pour a few pumps in your coffee and top with whipped cream and pumpkin sauce and you have a little vacation moment on a cold morning. The pumpkin spice flavoring syrup is terrific and a great fall inspired syrup for making great drinks. The spice pallet is great and a nice treat for our coffee shop. I always struggle to find exotic flavors in the restaurant store for my coffees and hot chocolates. I love the selection on webstaurant. Quick and easy delivery is a plus. This wasn’t as popular as I expected it to be with all the fall pumpkin rave. It’s got a pretty good flavor though. A bit more of a Spicy bite than I wanted, but it’s decent. Pumpkin Spice is a must. I used to think it would only be a seasonal hot latte but they make a great cold espresso as well. Torani Pumpkin Spice Flavoring Syrup has really a great flavor and a great compliment to any cup of coffee or even an iced drink. Our customers love it! Who doesn’t like Pumkin Spice in the fall! The Pumpkin Spice has a wonderful flavor with the lattes and coffee. All time favorite during fall. This was our first year / season using this product and it was a hit! We used it for our pumpkin spice frappes, milkshakes, and lattes. The flavor is amazing. Pumpkin spice lattes are popular in the autumn. This syrup from Torani is the great tasting flavor needed to make the best lattes we can. This is the first time we tried the pumpkin spice syrup, and were a little worried because some other pumpkin spice products just aren't right, but we should have known better with it being Torn! The flavor was spot on and made all of our customers very happy! We even made some pumpkin spice hot chocolate, which was a big hit! We used this for a short while before switching to the Torani Pumpkin Pie Flavoring Sauce. There's nothing bad, per se, about the syrup, but the sauce has a richer flavor. Just what is needed for the crisp fall season. Very good flavoring, though some of my co-workers have said it can be very sweet in coffee. I compared this syrup to the Torani pumpkin spice sauce and although I prefer the other one better, this one does blend well in lattes. we liked the smell and tasty, but the pumpkin flavor is kinda weaker than pumpkin sauce by Torani, so we make decision to use pumpkin sauce other than syrup. sauce makes more deep tasty. This pumpkin spice syrup is good but it honestly isn't what I hoped it would be. By the time I get the desired strength of flavor my drink is too sweet. This Torani Pumpkin Spice Flavoring Syrup is perfect for our flavored lattes. It is that time of year where Pumpkin is king. We use it for our hot and/or iced versions of the latte. The size is great too, as we use the pumped that we purchased for them. An absolute must for this time of year! Before you know it, I may be adding pumpkin spice flavoring syrup to my apple cider! Haha. Wonderful for this time of the year. Its starting to cool down and this Torani Pumpkin spice flavoring syrup is a hit here in the diner. I have nothing but good things to say about this product! If you love pumpkin spice like I do the you need to try it! I use it in my hot coffee in the morning and it taste amazing! Great seasonal flavor. Customers love it. Tastes awesome in a cup of hot or iced coffee. Try with brown sugar cinnamon torani syrup for that extra fall taste ! This is a nice flavor to have stocked. It adds a fall flavor to any drink and instantly warms you up. It smells great too. This syrup is okay. It's not really that strong and doesn't impart much flavor in coffee. It smells good on its own though and I imagine it may be used better in baked goods. Coffee just overpowers the flavor. This is one of those drinks that when the holidays come around you won't be able to keep in stock. This syrup goes awesome with everything. The pumpkin spice syrup is a must during the fall season in our coffee shop. The flavor is smooth and bursting with that nice spice flavor everyone loves. We use it in our lattes, macchiatos, and coffees. So this was a very big hit from October through Thanksgiving. You don't need much of this since the spices are very fragrant. Unlike other flavors you can get by with 1-2 pumps in a 8oz cup of coffee. We found any more than that it is overbearing. Not the best pumpkin flavoring I've tried but not the worst either. This one is pretty good and unlike the thick sauces it's easier to mix into drinks. This is an extra kick to the regular pumpkin spice in powder form. I think this is so good and it has that nice flavor. This syrup has excellent flavor and is makes the perfect lattes. it also pairs well with caramel and vanilla syrups. I love that this Pumpkin flavoring isn't too overpowering. Far better than others I have tried. My customers rave about this pumpkin spice flavoring syrup! It's perfect for the seasonal drink lovers! Works great in all of my coffee or espresso beverages! A must have for flavored coffee enthusiasts! The smell of this syrup reminds you of the holidays, great for cappuccinos, macchiatos, or just add it to your coffee to flavor it! Fall is already here & I was glad I was able to buy this little guy had mothers & students already asking for pumpkin flavor coffee & lattes & frappucinos! Really delicious. I add it to my coffee in the morning, my hot chocolate I sell at my shop and I even have used it to make an Italian cream ice! Weather this pumpkin spice syrup is in your restaurant or your home you will make a great addition to the upcoming holiday season. The flavor is spot on and with pumpkin spice being all the rage this one will be a big hit with your family or customers. It's delicious in many desert recipes and we'll added to my morning coffee..
Really great flavor at half the store price, Shipping was fast. We made pumpkin brittle and it was great. Came in perfect condition and care was really taken when sending this out. Tried it on coffee but this has a very "true"pumpkin taste not like competitor coffee so I would not do that again. I am going to do a pumpkin tiramisu with it and expect wonderful results as well. just like drinking a latte at a coffeehouse. i prefer torani products over any other. plus they have a long shelf life so i dont have to rush to use it all up. Pumpkin spice is a traditionally popular flavor in our family for the Holidays. We make many dishes that this Torani syrup fits nicely with. I wanted to get a head start this year, which is why I have gotten the Pumpkin Spice, while it lasts! There is no need to go to all those coffee shops for a pumpkin spice latte when you can buy this syrup and make them from home anytime you want! All year long!! Torani Pumpkin Spice Flavoring Syrup is a holiday favorite! The fall season is known for the pumpkin flavors to come out. The syrup makes a great Latte! Tastes just like Starbucks but we use this for our milkshakes with a diary vanilla soft serve ice-cream so its even better totally excited to have found this flavor. 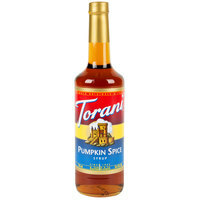 Torani 750 mL Pumpkin Spice Flavoring Syrup is the white girls dream come true! :D Such a better compilation and taste than the expensive coffee shops! I love that there's so much of it! This is our first experience serving coffee in our new shop and our first time using Torani syrups. I love everything pumpkin and I was looking for the classic spicy pumpkin taste I have had from other coffee shops. This flavor is interesting because it tastes less spicy and more like actual fresh pumpkin. It's interesting and a nice addition to my flavor selection. Loved the fact that Torani made Pumpkin Spice Flavoring Syrup because that is the rave of the fall. I think every Cafe/restaurant should have this in their pantry. Did get pumpkin spice AND pumpkin pie flavoring.. while they are practically the sane flavor they do have significant differences. The pumpkin spice is more, spicy which is the typical pumpkin spice seasonal favorite. It's that time of year again! We normally start our Pumpkin Spice drinks the 1st of October every year. We've found that Toranis Pumpkin Spice Syrup is the best out there. It makes all of our espresso based drinks even better! I bought a latte one time and didn't care much for pumpkin spice but my husband told me to get it for him. Well I tried this in iced coffee. Wow. I am addicted. This one really packs in the flavor. trying to download the video to share with you all.. The pumpkin spice flavored Torani is perfect in our pumpkin spice lattes. The Torani is a perfect mixture and flavor to mix in with our drinks. We buy all of our flavors ahead of time and save on shipping! I'm so glad we have pumpkin spice for our Fall latte special. All the Torani flavors are good! The perfect fall flavor! We use this in Lattes and blended beverages, it works perfect! if you are looking at this flavor or the Pumpkin Pie, choose this one, it is a smoother and better flavor. My husband really likes this for a Fall drink. It does have a spicy flavor, but it is very good. Makes you warm on the inside! Our customer has been raving regarding the quality and flavor of torani coffee flavoring syrups. love it a lot and delivery was very fast and it comes in glass bottle which I like! Compared to another brand's "Pumpkin Pie" syrup, this one is better. Less artificial tasting, less syrupy and sugary sweet. Makes a good pumpkin spice latte. We have been using Torani syrups for years and have been impressed with just about every flavor we've tried. Our customers love the pumpkin spice this time of year. This Pumpkin Spice flavoring, is literally the near vegan substitute that I have ever tried. As a lover of the fall season, I crave pumpkin spice, unfortunately going to Starbucks or Dunkin, just won't do it because their flavoring contains dairy. This product is completely vegan and my friends and I love it!! This Pumpkin Spice Syrup adds some nice, sweet and spicy flavor to lattes, cappuccinos, and coffee. It's a great texture and value. The flavor reminds more of a chai tea type spice over pumpkin, but I was personally glad for that surprise. I don't think it has a strong pumpkin flavor but I still think it's delicious. Perfect for those fall and winter warm beverages topped with whipped cream, nutmeg and caramel drizzle! I love Torani syrups, they are fairly priced. The pumpkin flavoring is great for the holidays. Or flavors like the vanilla, carmel, or white chocolate taste great in black tea or coffee.